We have two state of the art simulation centers at both Banner – University Medical Center Phoenix and the UA College of Medicine – Phoenix. These are utilized for the following organized experiences. One Day Critical Care Curriculum – As part of each Banner – University Medical Center Phoenix critical care rotation, interns and residents spend one day learning from one of the senior ICU attendings in the simulated setting. Central lines, ultrasound and ACLS are reviewed and practiced in this small group setting. 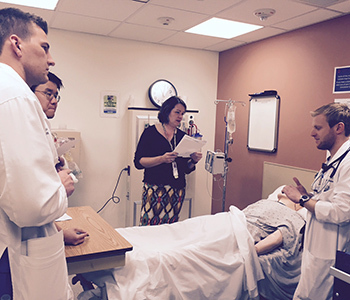 PGY1 Simulation “Boot Camp” – During the spring of each year, all categorical and MP interns participate in three or four half day sessions to prepare them for the role of supervising senior resident. They practice cases involving inpatient ward emergent conditions (severe pancreatitis, severe COPD exacerbation, sub-massive PE, alcohol withdrawal, SVT, neutropenic fever, foley catheter obstruction, etc). The goal is to learn initial management, how to recognize when you need help and how to access it in our systems. Other sessions – These include ACLS, Fundamentals of Critical Care Medicine course, procedure practice and open hours.